Supriya Tomar, M.D. is a board-certified dermatologist and fellowship trained specialist in Mohs micrographic surgery and reconstruction. Dr. Tomar graduated from the University of Illinois with honors and highest departmental distinction in Biological Sciences. She then received her medical degree from Rush University School of Medicine in Chicago. She received her dermatology training at the University of Pittsburgh Medical Center and went on to receive extensive training in Mohs Micrographic Surgery at the leading skin cancer treatment facility, The Center for Dermatology and Skin Surgery, in Tampa. Dr. Tomar is well known for her expertise in designing anti-aging, anti-acne, and anti-rosacea treatments with exceptional success and optimum cosmetic elegance. Her goal is to effectively help you see dramatic improvement both in the appearance and the health of your skin. Dr. Tomar specializes in non-surgical cosmetic enhancement. She approaches her patients’ cosmetic needs with an artistic eye and helps all her patients look their best. 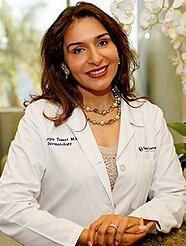 Dr. Tomar is well known for giving her patients beautiful and natural-looking results. She continues to incorporate the latest technology and state-of-the art treatments to meet her patients’ needs. Dr. Tomar is one of the busiest injectors in Palm Beach County and has been the recipient of the Platinum Award from Allergan and Medicis. Patients from all over the country seek her expertise. Outside the office, Dr. Tomar enjoys spending time with her husband Steve and two daughters Victoria and Serena. Her hobbies include oil painting and classical dance.